Definition at line 21 of file Port.h. Definition at line 24 of file Port.cc. References COMM_DOBIND, COMM_NONBLOCKING, and Ipc::UdsOp::setOptions(). Referenced by Ipc::UdsOp::clearTimeout(), doListen(), Ipc::ImportFdIntoComm(), Ipc::UdsOp::setTimeout(), Ipc::UdsOp::timedout(), Ipc::UdsSender::write(), and Ipc::UdsSender::wrote(). References buf, comm_read(), Ipc::UdsOp::conn(), debugs, HERE(), JobCallback, noteRead(), Ipc::TypedMsgHdr::prepForReading(), Ipc::TypedMsgHdr::raw(), and Ipc::TypedMsgHdr::size(). Referenced by noteRead(), and start(). Referenced by Ipc::Coordinator::handleCacheMgrRequest(), Ipc::Coordinator::handleRegistrationRequest(), Ipc::Coordinator::handleSharedListenRequest(), Ipc::Coordinator::handleSnmpRequest(), Ipc::Inquirer::inquire(), CollapsedForwarding::Notify(), IpcIoFile::Notify(), and Ipc::Coordinator::notifySearcher(). Definition at line 76 of file Port.cc. References assert, buf, CommIoCbParams::buf, CommCommonCbParams::conn, debugs, doListen(), CommCommonCbParams::flag, HERE(), Comm::OK, Ipc::TypedMsgHdr::raw(), and receive(). Implemented in Ipc::Coordinator, and Ipc::Strand. 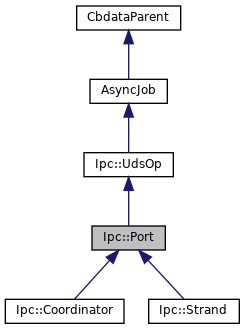 Referenced by Port(), and Ipc::UdsOp::timedout(). Definition at line 30 of file Port.cc. Referenced by Ipc::Strand::start(), and Ipc::Coordinator::start(). Definition at line 45 of file Port.h. Referenced by doListen(), and noteRead().